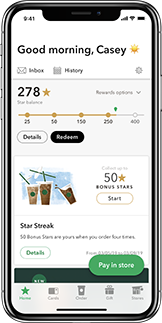 Our Starbucks app lets you conveniently pay by phone for purchases, earn Stars and redeem rewards with Starbucks Rewards™ find stores, and so much more. Click below to download an app and enjoy cashless payments. The Starbucks® app for iPhone® makes it fast and easy to pay for your favourite drinks and food. Order ahead and pick up your drink without waiting in line with Mobile Order & Pay. You can also tip your barista digitally right in the app. Currently available at participating stores across Canada. It’s all here on the Starbucks® app for Android™. Get quick access to your Starbucks Card with Shake to Pay and track your rewards. You can also order ahead and pick up your drink without waiting in line with Mobile Order & Pay. Currently available at participating stores across Canada.